Engaging more than 1000 children in "Soccer in the Quarters"
Camaquito is a politically and religiously independent Swiss Children’s Aid Organization that supports Cuban children and teenagers in the fields of health, education, environment, sport and culture. Camaquito was founded in Switzerland in 2001; the year 2003 saw the launch of Camaquito Germany. Camaquito is convinced that sport is an important way of providing a lasting contribution to the development of Cuban children and adolescents. This is why sports activities have become an important component of Camaquito's project strategy. Camaquito focuses in particular on the project „viva el fútbol“. Playing football is a way to broaden and improve available leisure activities. This is the philosophy behind the children football program "fútbol en los barrios" (football in the quartiers) for girls and boys, a program that provides access to football and to sport in general for thousands of children. The main objective is to provide children and adolescents with access to football. In this way we can provide not only a beneficial pastime, but also fulfill the specific wish of many Cuban children – to play football. In a wide variety of remoter city districts we convert unused plots of land into football pitches. We also attach great importance to developing the skills of the local football coaches. Workshops and tournaments in the outskirts are implemented for this purpose to achieve the social objective of personality development through football. Am nächsten Wochenende vom 9. - 11. Juni präsentiert das Ballet de Camagüey die von Camaquito produzierte CARMEN (Choreographie Peter Breuer) im Gran Teatro de La Habana "Alicia Alonso". Heute ist ein weiterer Container mit Material für unsere Projekte (Landschule "Roberto Reyes", Kindertanz- und Theatergruppe "La Andariega" und das Café Literario) in Camagüey angekommen. Wert über USD 46'000.--. Herzlichen Dank an alle Spenderinnen und Spender. Fröhliche Kinder während unseren kulturellen Aktivitäten mit unseren kubanischen "Payasos". Wie hier zum Beispiel in der Spezialschule für sehbehinderte, blinde und gehörlose Kinder oder im Kinderspielplatz "La Edad de Oro". Beide Institutionen erhalten seit vielen Jahren die Unterstützung von Camaquito. Mit unserem Fussballprojekt "viva el fútbol - fútbol en los barrios" können wir 1000 Mädchen und Knaben zwischen 8 und 15 Jahren auf und neben dem Fussballplatz unterstützen und begleiten. Zum 3. Mal hat der Kiwanis Club Uri grosszügig Camaquito unterstützt. Muchas gracias! Ab diesem Jahr unterstützen wir mit weiteren Etappen die Entbindungsklinik von Camagüey. Am nächsten Wochenende (6. und 7. Mai) präsentiert die von uns unterstützte Kinderabteilung (Centro de Promoción FERNANDO ALONSO) des Ballet de Camagüey eine weitere Vorführung im Teatro Principal in Camagüey. Auf der Bühne werden die Kinder von "danza español" stehen. Es wird wieder über unser Fussballprojekt berichtet. Herzlichen Dank an alle Läuferinnen, Läufer, Sponsoren und Partner die trotz Schnee, Regen und Kälte uns am gestrigen Charity Run in Winterthur unterstützt haben! Confiserie Sprüngli und Camaquito machen es vor! Eine tolle Aktion und wir hoffen, Ihr macht da mit. El fin de semana en el Teatro Principal. El Ballet de Camagüey vuelve al escenario del Teatro Principal el Sábado 8 de Abril a las 5:00PM y domingo 9 a las 10:00AM. En esta ocasión se presentará el Centro de Promoción de Ballet y Danza “Fernando Alonso”, adjunto a nuestra Compañía, con la obra “ Pedro y el Lobo”. Una versión coreográfica de la maître Lila Martínez de la Torre estrenada en el 2015 con la música de Prokofiev. 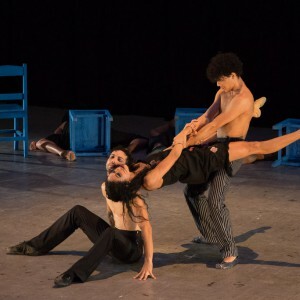 Das Ballet de Camagüey kommt in die Schweiz und nach Österreich! Verterter unserer Camaquito-Projekte "futbol en los barrios" und "vivan los barrios" besuchen den Kinderspital Camagüey. Gestern organisierten wir den 1. adorini und Cigar Journal „Camaquito Charity Event“ in Havanna. Der Erlös von EURO 4‘000.00 geht in unser Rehabilitationszentrum für behinderte Kinder in Camagüey. Muchas gracias a todos! "Busco despertar sueños, inspirar ilusiones! Y empoderar a quienes me rodean Para que sean "agentes de cambio positivo"."